The Black Mariah upstairs in Triskle Arts Centre. It is a show designed and made for children aged around 8 to 10 years old and we would love to welcome children to this showing. 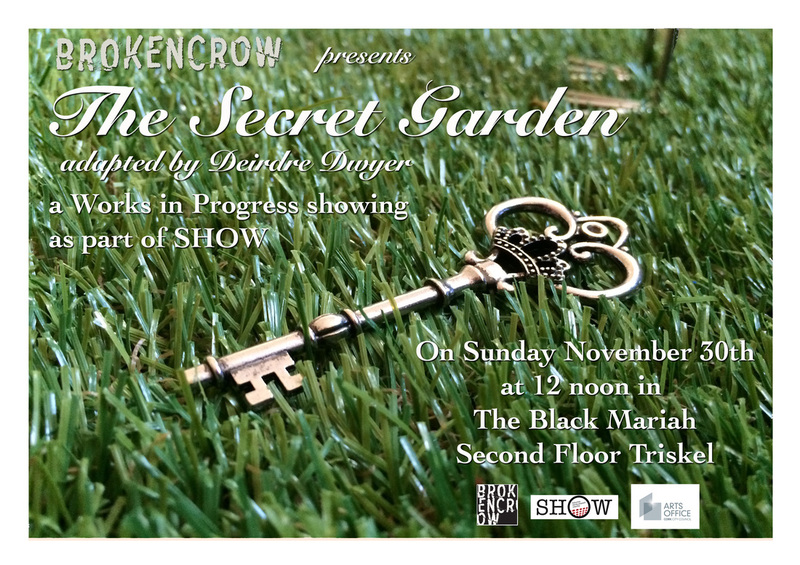 The Secret Garden is an adaptation of the well loved children's story by designer, and BrokenCrow Ensemble member, Deirdre Dwyer, primarily aimed at children between 8 to 10 years old. Using all of the senses, and a healthy dose of surprise and intrigue, this classic tale of secrets, friendship and growth is unlocked and reimagined for a new generation of young people. Deirdre will be working with actor, designer, maker Nicholas Kavanagh and actor, collaborator Mary Louise McCarthy amongst others to make this show. Deirdre is a member of BrokenCrow. Broken Crow are an annually renewing theatre ensemble who carry out ongoing creative conversations and meet up regularly to try things out and develop projects. They are developing this project as part of their creative stable of projects. This development has kindly been supported by Cork CIty Council Arts Office. Deirdre and BrokenCrow were delighted to receive an award to develop this adaptation and would like to thank the Arts Office for their support in this project. Deirdre would like to thank Julie Kelleher and Aideen Wylde for their ongoing support and for their participation in last years development week. This development has also been facilitated by Graffiti Theatre Company and Everyman Cork.